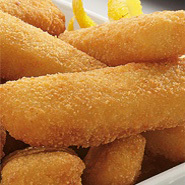 At Eurofrits we have the widest range of frozen products of the variety Fish specialties. Battered or breaded trapezoidal-shaped hake fillet portions. Pre-fried. Hake fillets coated with golden crunchy breadcrumbs. Battered and pre-fried product made from minced hake. Trapezoidal-shaped battered minced cod portions.